Image of the Day: Bird, Plane, or Cyborg? 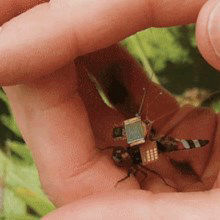 Rather than attempting to recreate an insect's dynamic agility with robotics, scientists have created a hybrid that's part dragonfly, part robot. A completely colorblind musician and painter perceives the world in a new way with help from technology. Snails with implanted electrodes generate electricity via metabolism.